It is good news (at least for me) that I have finished the first draft of my second book, Coming to Amerika. The first draft has been undergoing editorial review from the professor at Northern State University who translated many of the letters used in this immigrant story. I have started on the second draft and am looking for people willing to read the chapters and give me feedback. I want this to be a compelling, nonfiction family saga and need readers’ reactions. If you are willing to go on this second journey with me, please let me know and I will feed you chapters as I progress. To give you an idea of what it encompasses I am including here the introduction. We are, as John F. Kennedy once famously wrote, a nation of immigrants. Driven by famine, warfare, religious persecution, and political and economic oppression, we came to the United States attracted by the opportunity for a freer life and greater economic security. The story, of course, is more complex than this. There are those of us who were brutally brought here as slaves and found no freedom or opportunity. And, there were those already here who lost much in people, property and their ways of life as a result of contact with immigrants. These are the sweeping generalizations of standard history books. Beneath them, however, lies what I call “history at the ground level”— the unique stories of the individuals who lived the events so briefly described in the books. Coming to Amerikais one such unique story. It follows the fortunes of members of the Lodholz family as they journey to and settle in the United States. Having a B.A. and M.A. degree in the field, I have been passionate about history since a teenager in Beirut, Lebanon, where my father was a diplomat and we explored Sidon, Tyre, Baalbek and the great Crusader castle of Krak des Chevaliers. 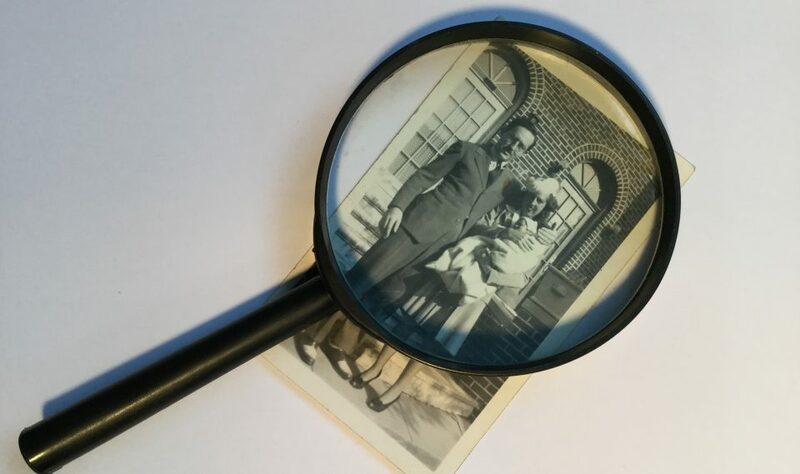 This passion has now been fueled by an extensive collection of family documents and photographs, spanning some 100 years from 1850 to 1950, which came into my and my brother’s possession upon the death of family members. This comprehensive archive is unique in its breadth and depth. A true story, it rivals fictionalized family sagas such as Buddenbrooks, The Thorn Birds, Roots and the novels of James Michener. The family seemingly threw nothing out. Letters were saved to be savored on multiple readings. Even receipts for the sale of eggs and small drawings by children were placed safely away. In them I found a richness of detail about the lives of a wide variety of individuals I had never known, each with his or her own quirks and personalities. It made a century of American history come alive and I wanted to share this discovery of what it was like to live through those times. In addition, as an historian, I am acutely aware that immigrants have often met with hostility, the Irish and Chinese being prime examples. We need to be reminded, with works such as Coming toAmerika, that it is the immigrants’ successes, failures, trials and tribulations which are the stuff of which this nation is made. The book is divided into two parts, each focusing on one generation of the family. In Part One: The First Generation you will travel with fifty-two-year-old Anna Maria Lodholz and her two teenage children as they leave Ebhausen in what is today Germany, sail on the S.S. Fox through the storms of the Atlantic to walk right off the ship in New York City (no Ellis Island at the time) to join two older children, factory workers in Terryville, Connecticut. You will follow the family westward to be among the earliest settlers on the seemingly endless plains of Kansas. There with few comforts, they risk crop failures, prairie fires and grasshopper plagues for land of their own and independence. Their prairie life contrasts dramatically with the unsettled factory existence of the one family member who remains behind, working in the Colt pistol factory during the Civil War and facing possible conscription. Later, in Part Two: The Second Generation, you are introduced to the family of daughter Anna Regina Lodholz, married to Henry Reb, blacksmith and farmer, and their many children who after Henry’s death help their mother keep and grow their farm into a prosperous enterprise. Along the way you will meet a security guard at the Chicago World’s Fair, a woman who mastered printing glass plate negatives in a horse trough; a husband who took his wife and young child to California in the vain hope of curing her of tuberculosis; and a farmer hit hard by the Great Depression, losing two farms and reduced to working as a handyman to try to make ends meet. All these and more are the real-life characters whose voices you will hear in this narrative. In writing Coming to Amerika, I found myself submerged in their world. I hope that you can take yourself back almost two centuries now and find pleasure in submerging yourself in their world too. It is difficult to convey from our present perspective how important letters were to our ancestors. Often separated by many long miles of difficult to traverse terrain, relatives and friends found in letters an emotional attachment to loved ones as well as information about their health, joys and sorrows; hard times and bountiful harvests; the quick strike of death and the newborn child. Translated for the first time for this book, the letters and documents in Part One: The First Generation were written in Old German. I have generally kept to the translators’ wording while formatting the material into more coherent paragraphs. Paper was valuable and postage cost money so the letters were often crammed with writing. The letters and documents in Part Two: The Second Generation were written in English. In transcribing these, I have kept the spelling of the writers and provided the modern correction only when it is not obvious what the word signified. Keeping the original spelling allows the reader to catch the accent of the letter writer. The letters contain run-on sentences and paragraphs, often skipping abruptly to new topics, one indication that the letters were often written in several sessions. In this case I have divided sentences, inserted punctuation and created paragraphs in order to make the text easier to follow. In both parts I have added contextual information about events mentioned and unfamiliar terms and items. This information is hardly meant to be exhaustive and leaves the reader to explore further if he or she is curious about it. The letters are of course arranged chronologically, but they are not consecutive, that is, there was obviously more correspondence than was actually saved. The sequence of letters, however, provide a consistent story of interwoven lives. Coming to Amerika reads I hope like a good epistolary novel.